I am including this page as these glazes were all given to me freely, and I am often asked for the recipes and about glazing processes at workshops and lectures. I had been from the one dunk school of pottery glazing when I entered graduate school. During my second year, I fell off my bicycle into an irrigation ditch and broke my wrist. That pretty much took me out of making work for the rest of the semester. I did have a stack of bisqueware in my studio and I spent the rest of the spring decorating, glazing and re-glazing this wear. When I went to Nova Scotia College of Art and Design for a semester, I very much wanted to combine the versatility of color from Majolica with the density and strength of porcelain. Alec Karros was working at the mid-range temperature in Boulder with colors that I had never seen before. I began working with his glazes, though now I had to figure out how to put all these colors together. I had a wonderful Art Theory lecture class with George Woodman: George is an art theorist, wonderful painter, and a very sharp dresser. During class I took notes on his clothing, and then went down to the studio to glaze my pots accordingly: tan pants with a royal blue tee-shirt over a green button up and gray shoes, turned into tan flashing slip, gray on the foot of the pot, royal blue on the inside of the pot or spout or handle and patterned in different shades of green. We put all kinds of colors and textures together when we get dressed every morning, and when it comes to glazing, I think this is a good place to start. Second is a “historical glaze:” a glaze with h5 historical ties. The glaze itself can become the content in the work. I think about glazing while I am making pottery. I set up situations or predicaments in the pots that will not be complete with some surface decoration or ornamentation. I do about half of my surface decoration with slip at the still leather hard stage of clay drying. 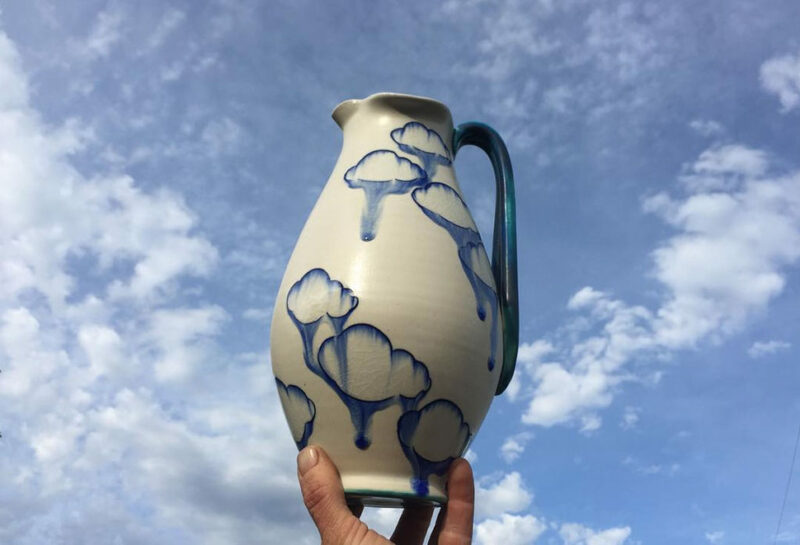 Walter Ostrom explained surface decoration to me through historical pots – he said that in the whole history of pottery, all decoration breaks down into three categories: “dots, lines, and floral representation”. I have added “image” to the list. Basically, when I am not sure where to start in decorating, I go back to this list, dots, lines, floral representation and image – and them I start to combine them. By then, I am off and running and not so self-conscious about mark making. Once in speaking with Liz Quackenbush she described the difference between decoration and ornamentation as this (I am paraphrasing here) “Decoration is something that animates space, often on the surface of something – it brings great beauty to something. Ornamentation gives something power through meaning. A pattern around a doorway makes that entry beautiful and tells you it is special. The lion head knocker in the door was originally used to warn enemies away, it was to protect the dwelling”. Sometimes when I am a little stuck, trying to figure out form and surface, I ponder these things. I work with mid-range porcelain, bisque fire to cone 08 and glaze fire in a soda kiln to cone 6. Pretty much everything that I make starts on the wheel, and then is altered to some degree. I use a shimpo RK-2 that I bought in high school with my baby sitting money and had in my room between my bunk bed and dresser. I often throw standing up – and for this I use a Brent model “C” wheel. I fire in a soda kiln in a neutral to clean atmosphere, and spray about 3 pounds of soda ash mixed with 2 gallons of water when cone 5 gets soft. If the kiln is stacked really tightly (I can slip a piece of paper between the pots) I will also put in about 1 pound of salt to help with some consistent coverage on the surface of the pots. These recipes have been collected from all over, but I want to especially thank all the folks at Nova Scotia College of Art and Design: Walter Ostrom, Doug Banford, Joan Berneau, in addition, Alec Karros, and Chloe Rizzo. After a lot of testing, I still use Barium Carbonate in some of my glazes. I do not use it on any surfaces that come in contact with food. I also use gold and platinum luster and always wear gloves, use a respirator with new filters, and a good ventilation system. I do not use Barium, Manganese, Vanadium Pentoxide, or Strontium on the insides of any pots. Please be responsible about how you use these glazes.